This week Colonel Light and his crew continue to search for sources of fresh water. They are heading south looking for a river that an Aboriginal woman has told them about. This week we will think about this story from an Aboriginal perspective. We have been following the journeys of our nine ships as they make their way from England to establish the province of South Australia but what did this mean for the Aboriginal people who were already living there? How did these people feel when the ships arrived and how did the events that followed affect them? Colonel Light refers to several encounters with Aboriginal people. What evidence is there in his notes to show how the Aboriginal people reacted to these encounters? What evidence is there that Colonel Light is able to learn a lot about South Australia's landscape and environment through the knowledge, skills and lifestyles of the Aboriginal people? We have looked at the high level of importance Colonel Light placed on access to fresh water when selecting a site for the colony. What evidence is there that water also had a significant influence on where the Aboriginal people chose to live? 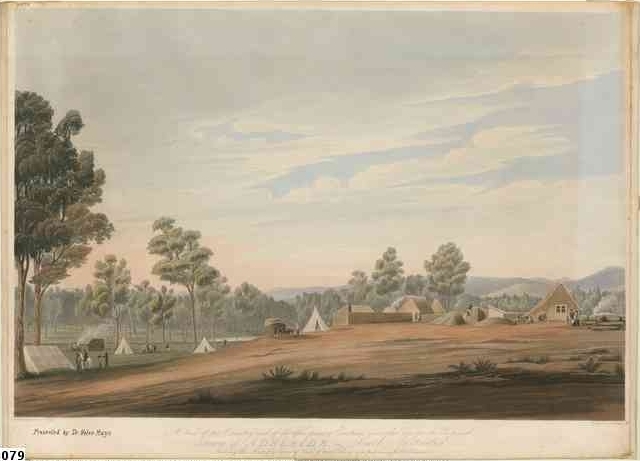 Where in South Australia were Aboriginal people living at this time? Why were these places chosen by the Aboriginal people and how did the changing seasons and environment influence the way these people lived? Colonel Light refers to several places by name including Sturt Creek and Jones Harbour. Who do you think named these places and how do you think Aboriginal people would have described the same places? We know that the Aboriginal people Light refers to would have been Kaurna people. Use an Aboriginal Language Group map to find out how far Kaurna Country extends. Which towns in South Australia today have been built on Kaurna land? Find out about the Aboriginal Language group/s who are the traditional custodians of the area you live in. What happened to the Kaurna people in South Australia after 1836? How did the arrival of British migrants impact on their lives? Where do Kaurna people live today? What relationship do contemporary Kaurna people have with the land and how do they talk about South Australian history? Develop a class bank of places in your area that have Aboriginal names. What do these names mean? Use a ball of string to demonstrate how long Aboriginal people have lived in Australia. If you use a metre of string to represent each century you will need at least half a kilometre of string watch out for tangles! Pose questions about what your local area was like before white settlement. Invite a local Aboriginal or Torres Strait Islander(ATSI) person to the class to help explore these questions. Investigate other sources of historical information about your local area including libraries, museums and historical organisations. Examine photographs of your local area taken at different times in history. Use your historical skills to find out information about the past in your area. Do you recognise the place in the photograph? Where is it? Does this place look the same as it does now? What looks different and what has stayed the same? How long ago do you think this photograph might have been taken? Is there any information in the photograph like signs or landmarks? Do I have other photographs of this scene to make comparisons? Are the buildings, fences, roads, beaches, trees etc. the same in both photographs? How does the environment look the same or different in the photographs? Who might have taken this photograph? Where was the person standing when they took the photograph? If somebody else took this photograph how would it look different? Interpretation and perspectives Examine a range of different maps of Australia. What similarities and difference do you observe in the maps? Are there any examples of places that have different names depending on the map you look at? How can a map present a particular point of view? Who produces maps and why? Use all of the information you have gathered from this inquiry to produce a double-sided poster about your local area. One side should show information about the local area before white contact and the second side should show information about the history of the area from this time. 1. Examine the history of your local area from an Aboriginal perspective. Invite local Aboriginal or Torres Strait Islander (ATSI) Elders to the class to talk about the changes in the local area during their lifetime. What are some possible reasons for changes in the natural and built environment? Are there any known events or milestones in your community that have contributed to these changes? Visit the local library to view historical pictures of the area, including sites of Aboriginal significance. 2. Investigate Aboriginal place names in your local area. Work with a local Aboriginal community member to find out about any other names that were once used for places and are still known. Consider negotiating with the local Aboriginal group and local council to involve students in helping to make signage for some of these places. 3. Read through this week's primary sources and imagine that you are a Kaurna person observing the expedition of Colonel Light and his crew. What would you think about their activities? What action would you take? How would you be feeling? This role play developed by the Department of Education and Children's Services in South Australia provides a comprehensive resource to give students an understanding and empathy for Aboriginal people's history in South Australia. Indigenous communities. Many of the games you see today have evolved from traditional games of the past. Select some traditional Indigenous games to play with your class. Which game is the class favourite and how do these games relate to other games and sports that the class enjoys? 5. Using your research, knowledge and maps depicting the past produce a sketch of a local place to show how the local area looked before there were buildings and introduced animals. Sketches should include local indigenous animals, shelters, people and plants. Now produce another sketch to show what the area looks like now. Challenge another class to 'spot the differences' in the sketches. 6. Invite an ATSI community member to tell a Dreaming story linked to a local site of Aboriginal significance. Visit the place if possible for the story telling. – local environment and ways of working with it? – roles of various language group members? Discuss the role of this and other Dreaming stories as a way of passing on knowledge and values through an oral tradition that spans over 40 000 years. Discuss as a class the similarities and differences between Dreaming stories from different regions across Australia. Discuss similarities and differences between Dreaming Stories and stories from other cultures. What do you think would have happened if a colony was never established in South Australia? How would Aboriginal people be living today if nobody else had ever settled in Australia? Colonel Light would have taken a lot longer to find fresh water if he didn't get help from Aboriginal people. Next week we will catch up with the passengers onboard the Buffalo. It is sailing in fine conditions near the mid-Atlantic Ridge and the young people hold some country dances on the deck. We will look at how people kept themselves amused and entertained during these long voyages. Congratulations on an excellent resource. I hope it stays online for a long time. The less familiar journal extracts in particular have given me new information about the movements of characters like George Bates who feature in my own research. I gather that the phrase ‘one week to go’ in the title is wrong, & you have actually finished. What a pity, then, that you’ve missed an extraordinary incident at Holdfast Bay on New Year’s Day 1837, recorded in the journal kept jointly by George & Margaret Stevenson. I think of it as a thought-provoking companion to Hindmarsh’s proclamation four days earlier, & an appendix to the role play developed by DECS to give students some understanding of the Aboriginal side of this history. On 1st January 1837 the family of Emigration Agent John Brown introduced Stevenson to a 25-year-old Kaurna man named “Ootinai”. Stevenson dressed him in the colourful military castoffs brought for such purposes, took him on board the ‘Buffalo’, & served him lunch in the Governor’s cabin with some of the other passengers. Young & charismatic, he “created a great sensation among the people on board”, & showed no surprise at anything. Though he spoke no English, he managed it all with great aplomb, right down to knife & fork. After the meal, two of Hindmarsh’s daughters played the piano which had served for musical soirees throughout the voyage; but it was only when Mr Hutchinson played the flute that Ootinai for the first time broke his cool. With Stevenson’s permission, “seizing” the ship’s paymaster Eales & also the rather prim & class-conscious Margaret Stevenson, he “began kicking and dancing with all his might”. We can only guess what Ootinai thought they & he were doing –peace protocols with a strange & potentially dangerous people, maybe? On January 3rd he returned to his tribe in company with Brown’s servant James Cronk, “whom he desired to take his gun, promising that he should bring back a kangaroo”. Cronk eventually became one of the early official interpreters, replacing the frequently drunk Kangaroo Islander, Cooper. The shipboard dance was a distillation of this early ‘honeymoon’ period of contact with the Kaurna people. As we have seen on your site, Dr Woodforde had played a melody on his flute in response to a corroboree by the Rapid Bay Aborigines on October 14th, though he did not dance. William Williams had brought in a Kaurna man & boy to Glenelg on December 1st & given them food, as recorded by Mary Thomas & Gouger. Joint dancing happened at similar stages of early contact in the eastern states (see Inga Clendinnen’s book ‘Dancing With Strangers’). These reciprocal things could happen only until the locals became aware that the strangers had a non-negotiable intention to stay, bring more people, & take over the land. What might have happened if Stevenson & Brown had responded to Ootinai with serious protocols? What prevented them from either recognizing or responding? How can we today ‘dance’ actually or symbolically with local Aboriginal people in a way which has more of a future than Margaret’s dance with Ootinai? Ootinai’s name was probably Ngutinai (Kaurna words never begin with ‘oo’, but almost all the early colonists failed to catch ‘ng’ when it happened at the beginning of a word). The incident is now commemorated by a plaque on Ngutinilla Reserve at Glenelg. Ngutinilla means ‘place of Ngutinai’. The event has sometimes been confused with a separate one at Port Adelaide when Ityamaiitpinna (‘King Rodney’) was lured on board a ship & dressed up. It is also the central event & symbol of my short music-theatre ‘Dancing Ngutinai’, written with protocols from local Aboriginal Elders & premiered in 2002. Well done, all of you who researched & built the site.